Nearly one third of voters would back the UK Independence Party if they thought the party could win in their constituency, according to a new poll by Opinium for the Observer today. The news comes on the same day that Ukip reveals plans to seriously contest 100 seats in next May’s general election, although it will stand candidates in all seats. Ukip’s star is in the ascendancy following a strong win in the Clacton by-election which gave them their first elected Member of Parliament in the shape of Conservative defector Douglas Carswell. He is expected to be joined in less than a month’s time by fellow defector Mark Reckless, who is polling in the lead in his constituency of Rochester and Strood. The successes have attracted further donations from millionaire businessman Paul Sykes, who earlier this year funded the advertising campaign for the party’s European election campaign. It is understood that he plans to gift Ukip around £1.5 million to fund the campaign, the Sunday Times has reported. “Our finances are now rebuilding again after the European election victory, but we will be raising significant further funds for a national campaign and a strong push to target marginal seats, probably nearer 100 than the 30-40 we originally identified,” said Sykes. Ukip’s election war chest is already looking somewhat healthier following a donation of £1m by businessman Aaron Banks last month, but the party still has some way to go before it can match the £18m pulled in by the Labour Party in 2012 and the £14 m received by the Conservatives in the same year. Donations typically rise just before an election – between 6th April and 6th May 2010, the month preceding the last general election, the Conservatives gained £7.3m in donations, and Labour £5.3m. Opinium’s latest polling on party support for the general election on behalf of the Observer puts Labour and the Conservatives neck and neck at 33 percent apiece, whilst Ukip continues to rise to 18 percent. The Liberal Democrats are languishing on 6 percent, and the Greens on 4 percent. 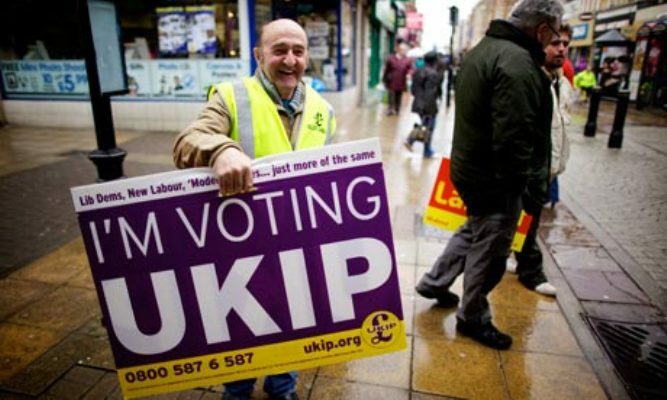 However, the survey also asked voters to respond to the statement “I would vote for Ukip if I thought they could win in the constituency I live in”. 31 percent of those polled agreed with the statement, including 33 percent of Conservative voters, 25 percent of Liberal Democrats and 18 percent of Labour supporters. On the question of whether a vote for Ukip was a wasted vote the respondents were divided, with 40 percent saying that it was, against 37 percent who disagreed. “These figures could have serious implications for all the main parties. In seats where Ukip are already well-established thanks to local election and byelection success, there will be a large pool of voters they can appeal to in their attempts to build a winning Westminster coalition in 2015,” said Robert Ford, who co-authored Revolt on the Right, an analysis of Ukip support. “In many seats, Ukip support may currently be suppressed by the perception that they are a ‘wasted vote’ – a perception which a party with little electoral track record will find it hard to combat. Meanwhile, it has emerged that the Conservatives have had to divert the majority of their election battle funds to holding marginal seats in the wake of the Ukip threat, with only a third of the budget being spent on the top 40 target seats in their sights. The Independent reports that, of the £2.5m given directly to local Conservative associations to fight their campaigns, £1.56m, or 63 percent, has gone to the 50 most marginal seats, whilst just £862,00 has gone to the top 40 target seats. The figures were calculated by the Labour party using data from the Electoral Commission. In the Eastern region where Ukip support is strongest, the figure being siphoned into defending seats rises to an astonishing 97 percent, leaving just three percent of the funding available to take on the four Lib Dem, two Labour and one Ukip MPs in the region. Two years ago, Conservative party chairman Grant Schapps said the party would show “no mercy” in mounting a challenge for its top 40 target seats. Senior Tories were sticking by the 40-40 strategy to hold their 40 most vulnerable, and take their 40 most attackable seats, but the funding picture tells a remarkably different story.